How to recover deleted photos from Samsung galaxy? Don't be at s loss. Develop a good habit of making backups regularly, then recently deleted photo recovery from Cloud backup/Google Drive. Or deleted photos recovery by Eelphone. 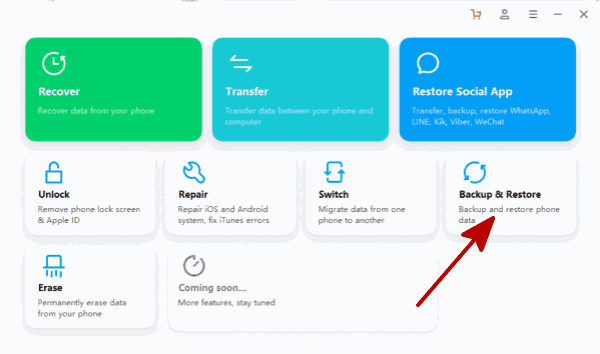 How to recover deleted photos from Samsung phone? We will be very anxious when Samsung deleted photos. Of course there will be a way to solve this problem. Mobile phone has become a necessary tool for us now. Today's mobile phone is no longer just a tool for talking. Because with the continuous development of technology, it has been equipped with all kinds of powerful functions, in which camera function is one of the most essential functions. You do not need a camera, because some mobile already can compare with the camera. With one mobile phone in hand, we can take pictures at anytime and anywhere to record the wonderful scene and important parts in our lives. But sometimes when we want to manage the phone files and photos, or other reasons, we may accidentally delete some photos. Is there any way to recovery delete photo that the cell phone has deleted by mistake? The answer is yes. How do i recover deleted pictures? The following context will help you learn about the way torecover deleted pictures from Samsung S9 / S8 / Edge S7 / S7 / S6 / Note 8 / Note 7 / Note 5 / Note 4, Galaxy A9 / A7 / A5 / S10 / Fold. Let's take a look. Part 1: Recently deleted photo recovery from Cloud backup/Google Drive. First, you are used to backup your phone data with cloud like Google photos and Dropbox in usual, this is a good habit because it makes you much easier to retrieve lost photos. It really helps a lot. It is so convenient to restore deleted pictures from Cloud backup or Google Drive trash. Don't forget to open the Google Photos Backup and Synchronization button, or it has been beyond the automatic storage time. You can find lost photos after three simple steps as follows. Step 1: Open the Google photos, log in to your account you have backup data and go to the Trash. Step 2: Scan all the photos presented on the right, select out those deleted photos. Pick out the photo to recover. Step 3: Do not forget to click the recovery option on the upper right, and it is done. What's more, At the top right, you can see that items in the trash in Google Photos will be automatically deleted in 60 days, while Dropbox will be available in the web version, and those deleted will only be saved for 30 days. If the image here has been deleted also, in this case, don't worry, we can use the next method. 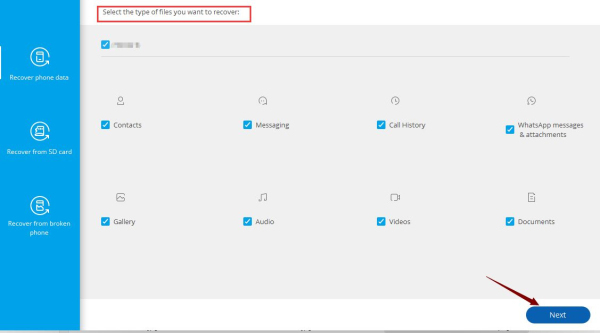 Part 2: Deleted photos recovery by Android Data Recovery. Another situation is that maybe you do not get used to make a backup for your phone data in the usual life, or maybe you cannot get the missing pictures you need in your Cloud backup or Google Drive trash because the 60-day period has passed. In this case, all you need is an effective software. You can Samsung restore photos by Eelphone Android Data Recovery. Eelphone Android Data recovery is a very useful data recover program that helps you retrieve the lost or deleted images from Samsung Galaxy S/ Note. You only need to connect the phone with computer via USB cable. 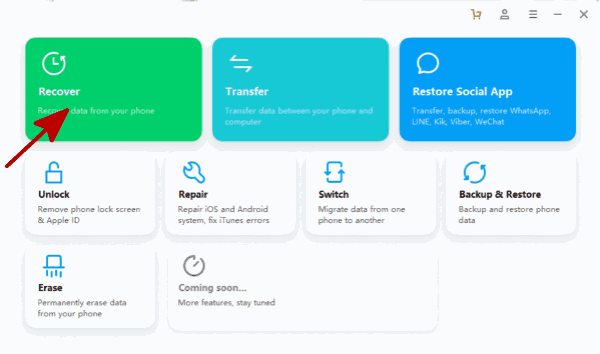 After connecting, Android Data recovery will scan your phone directly and present all data of your device, you can select what you want to recover. Let's see how to do it correctly. Step 1: Of course, the first of all, you should download the program. After you have installed the Android Data Recovery on your computer successfully, launch the program and click on “Recover”option on the dashboard and then plug your Samsung device into the computer. 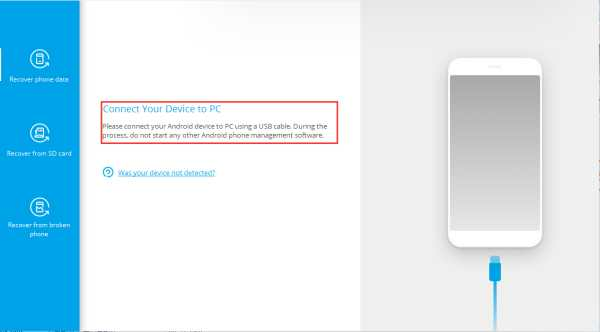 Step 2: There may jump out a page in your phone, you should allow USB debugging, just click on “OK” to move on. Step 3: Based on the volition of your own, you can select the type of file that you want to recover. In this case, you need to regain deleted photos, so it will be easier to find out the photo by choosing Gallery. Just tick the little box of Gallery, and then click on the Next button. Step 4: Here you will be asked to choose one of the scanning modes appeared on the window. There are two modes - Standard Mode and Advanced Mode. 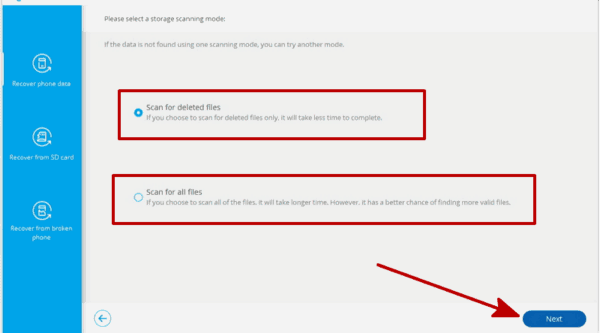 Usually you should choose Standard Mode at first, and there are still two types of scanning mode under Standard Mode – Scan for deleted files or Scan for all files. As you see, the latter will spend more time to scan but you will have a better chance to find out your lost photos. Think about what you need and then you can click on the “ Next “ button. If you still cannot find out the photo you need, you can come back to choose the Advanced Mode to scan your phone again. It will run a deeper scan for your phone. Step 5: After the scan finished, the result will appear. Have a careful look for all the result pictures until you retrieve lost photos. Remember to make sure the power of your Samsung phone is enough. If the scanning process gets stuck, it means that the automatic rooting fails and you need to manually unplug the device. Step 6: When you find lost photos you need, select it and click on the button “ Recover ”. You can restore deleted pictures into PNP, JPG, or GIF form. Now the deleted photo has been saved in your computer. If you need you can also copy back to your Samsung Galaxy S/ Note. Now your photo is back. Part 3: Develop a good habit of making backups regularly. If you do not have the habit of data backup in your daily life, I hope you can try to do it. 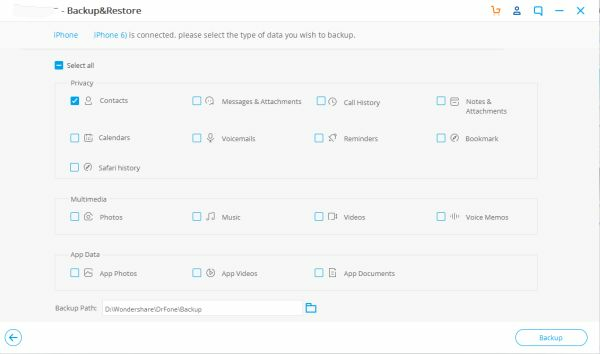 I suggest you a software – Eelphone Android Data Backup and Restore, which can help you make a data backup easily. Step 1: Install the software on your computer and open it. 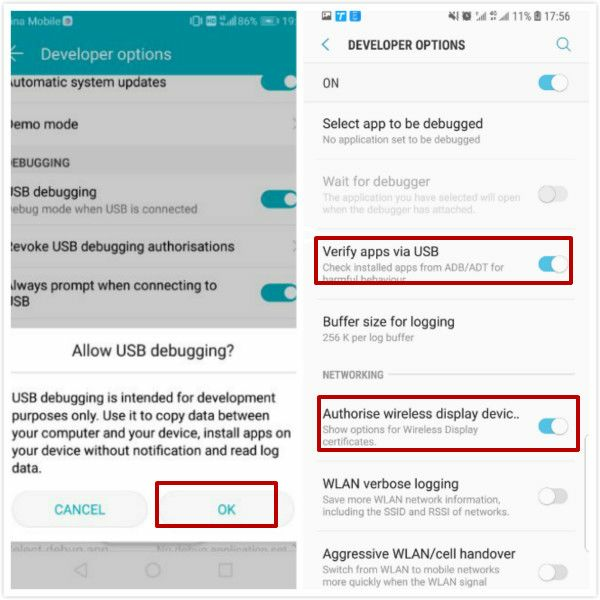 Connect your phone with the computer and allow USB debugging. Step 2: Click on the “ Backup ” button to begin making backups for all your data. In this process, please don't use your phone anymore and just wait patiently until it finishes. 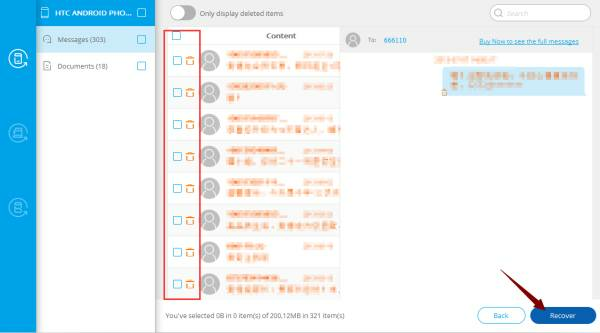 Step 3: You can see what have been saved by choosing “ View the backup ”. Hope it can help you.